This car seat or office chair cushion reduces pressure on coccyx, tailbone and hip bones while sitting on your office chair or car seat. When the pressure is taken off these specific areas it helps relieve tension in the sciatic nerve causing the pain to be reduced to a great extent. It also helps promote a healthy posture and proper spine alignment while sitting for long periods of time. This office chair/ car seat cushion is light and durable, and most importantly can be machine washed! Click HERE to find the best price for the Aylio Coccyx Seat Cushion. This seat provides a great amount of lumbar support forcing you to have a good posture while sitting down in your car seat. It is almost like having a back brace but without the uncomfort of having a brace strapped to your body! The pillows are made of premium memory foam, which makes the pillow soft and comfortable, it will offer strong support to your back and keep in shape even in long time driving. These pillows are also extremely easy to use with strap that allows you to connect it right to your seat. They come in three different colors black, grey, and beige. Click HERE to find the best price for the Valuetom Car Seat Cushion. This seat cushion is great to use on any office chair; however, it can be used on a car seat aswell. This cushion is like a wedge and will force you to sit upright causing you to use your natural upright posture so that you can relieve pain in the long run. It will also relieve the tension on the sciatic nerve causing pain to be reduced. The desk jockey uses 100% therapeutic memory foam and will never go flat no matter how many times you use it. Click HERE to find the best price for the Desk Jockey Seat Cushion. 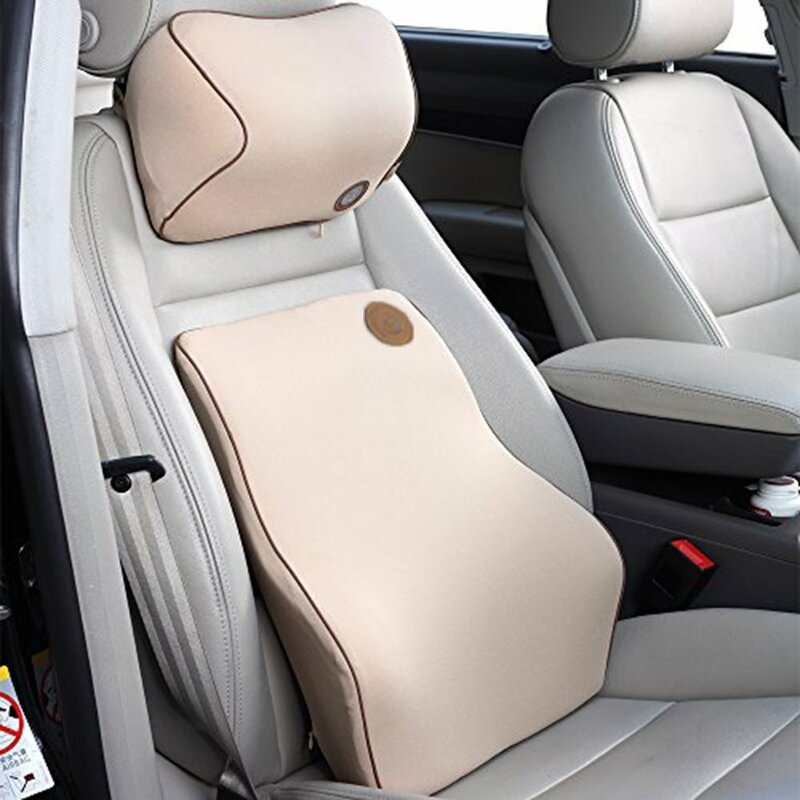 This car seat cushion provides great lumbar support for when you are riding in the car. Instead of slouching, this seat cushion will force your body into the upright position causing your back to have good alignment. This cushion is made with Premium Malleable Memory Foam that provides effective recovery for longer lasting support. This cushion is also machine washable. Click HERE to find the best prices for the LumbarMax Car Seat Cushion. This car seat or office chair cushion works wonders on relieving pressure on the sciatic nerve. This seat responds to heat, so when you take a seat it will form to you causing maximum comfort. Although, it compresses just enough to provide comfort yet keeps its shape to support your tailbone, spine, and hips. Click HERE to find the best prices for the Everlasting Comfort Luxury Seat Cushion. Be sure to check out other useful tips on what types of pillows and beds can reduce back pain!